GeorgeCMarshall is a Legacy Library. Legacy libraries are the personal libraries of famous readers, entered by LibraryThing members from the Legacy Libraries group. » George C. Marshall's catalog. 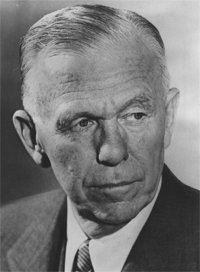 » George C. Marshall's legacy profile. GeorgeCMarshall is also an author. » See George C. Marshall's author page. About meGeorge C. Marshall (31 December 1880 - 16 October 1959), American military commander, Secretary of State, and Secretary of Defense. Served as U.S. Army Chief of Staff and as the chief military advisor to FDR, and is best known for his promotion of the "Marshall Plan" to rebuild Europe after WWII. Received the Nobel Peace Prize in 1953. About my libraryThe books included here are those housed at Dodona Manor, Marshall's home in Leesburg, Virginia. The tags are based on those assigned by staff at the house, and may not reflect Marshall's own organizational scheme.